There is a certain incomparable joy and sense of accomplishment that comes with handling projects around the house or workspace by yourself. However, some who share their stories of success sometimes fail to talk about specific issues such as how hard it is to choose working materials. For DIY enthusiasts, selecting the best corded drills can be both tasking and confusing. 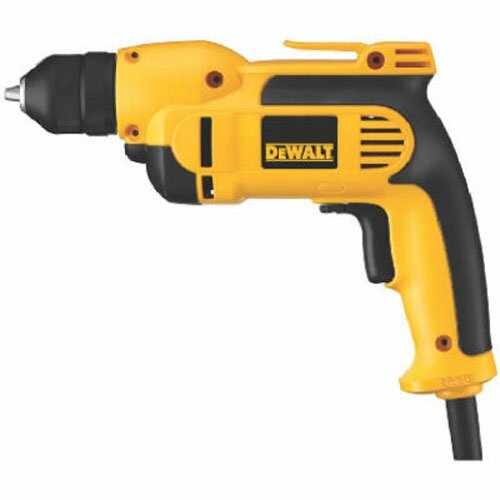 That is because there are lots of corded drills in the market and the fact that you have to look out for features such as the amperage or amp rating, its wattage, voltage, and others can sometimes take the joy out of DIY projects. Hence, we reviewed three products that we consider as excellent picks. BLACK+DECKER DR260C 5.5 Amp 3/8” Drill/Driver. The corded drills that we have included are all manufactured by companies that have been known for producing quality products for years. We have noted their specific features as well as the advantages and drawbacks of using each one of them. This corded drill from Black & Decker has a speed ranging from 0 to 1,500 RPM, a weight of 3.5 pounds, a size dimension of 10.8 x 3.6 x 10.2 inches, and an operational voltage of 120 volts. It is made of high-quality plastic materials and features a handle that has an ergonomic design. It also features a ⅜ inches keyless chuck that can be used for changing bits as well as a handle that is easy on the hands. This product is equipped with onboard storage which is a perfect place for you to keep your small screwdriver bit. Upon purchase, you will also get a storage bag for the whole tool and a screwdriver bit that is double ended. Likewise, in case there are any defects in the material of the product as well as any repair needs within two years of purchase, the company will replace or repair it for free. It is ideal for drilling through wood, metal, and plastic. It is capable of driving screws to fasten several materials. It is powerful, lightweight, and compact. You will have good control during drilling or driving. The bits can be changed quickly and easily. The handle is comfortable to grip making it easy to use when screwing things up high above your shoulders. The cord length is small. The chunk is usually frozen or too tight to put a drill in it. This will make it hard for you to release with hands, wrench or even turn it in reverse. Drilling for an extended period might also lead to the bit loosening in the chuck. This drill is equipped with a 3/8-inch ratcheting keyless chuck that is made of metal as well as a pistol-like VSR trigger. It is also integrated with a handle that has an anti-slip and soft grip design. This tool operates using a speed ranging from 0 to 2,500 RPM. With a weight of 4.1 pounds and size dimension of 9.6 x 10.8 x 3 inches, it can be used on wood and steel. Included upon purchase is a limited warranty of three years, money-back guarantee of 90 days, and 12 months service contract, as well as an instruction manual. This corded drill is perfect for both beginners and seasoned DIYers. It is too powerful for screwing. Vibrations occur when used at higher speeds which can affect the quality of work. With a weight of only 4.35 pounds, this tool is integrated with a 6.3-Amp motor that can work at a maximum speed of 2,600 RPM. It also has a Jacobs ratcheting, 3/8-inch keyless chuck that can hold your accessories very well, with little to no slipping. This is also equipped with a recessed handle that has a soft grip, a lock-on switch, and an oversized two-finger trigger. Likewise, Service Minder™ brushes have been incorporated that enable the drill to stop automatically when brush replacement is needed. In addition, sturdy belt clips are also integrated to free your hands when you need to work on other tasks. This product has an excellent power-to-weight ratio. You do not have to worry about not replacing the brush on-time. You can do other tasks while using the product. It has poor VSR control when used at low-speed levels. At times, more force should be applied midway through tasks since the trigger has a tendency to freeze. Locking this drill is only possible at full speed settings. The above-reviewed corded drills are amongst the best corded drills currently available in the market. Each of them has special features that are very useful to craftsmen and DIYers. 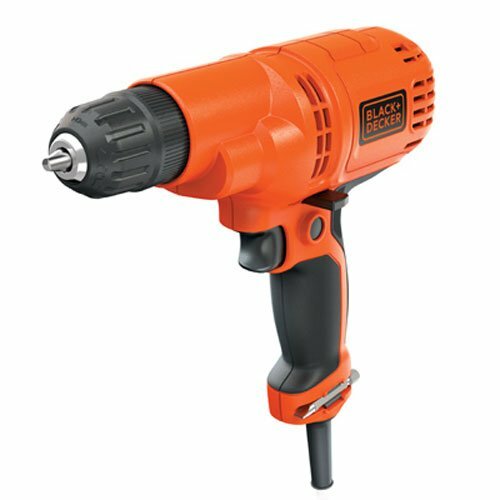 If you are someone who just needs to accomplish small DIY projects at home, the drill from Black & Decker will be a good choice. On the other hand, if your tasks are directed more towards drilling and fastening, the powerful drill from DEWALT is suited for you. 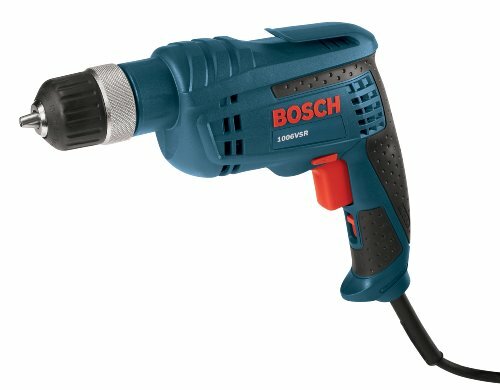 However, for us, the corded drill which stands out amongst the trio is the Bosch 1006VSR 3/8-Inch Keyless Chuck Drill. Even though it is a bit on the expensive price range, it has certain advantages over the others. Its 2,600 RPM maximum speed means it has better performance as compared to the others. Likewise, amongst the three, this is the only one that enables you to work hands-free.